We're in the off-season now as far as the actual performance company is concerned. For those of you who are not familiar with our saga, in 2003, Scott and I lost what was left our minds and decided to become cast members at Scarborough Faire. We traded the comfy, cool shorts and t-shirts from our previous eight years as patrons for layers of brocade and velvet. We dedicated 16 full weekends to rehersals and faire days. 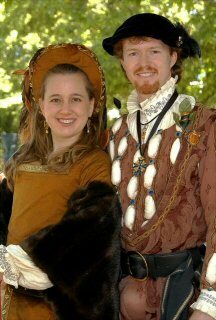 I learned how to use a sewing maching and sew and made my first Renaissance Court Dress which I started making Christmas 2002. From that date until June 1st. Scott had no life and I had less of one. We now seem to live in some odd state with the first 5 months of our year dedicated to Scaroborough Faire and the later 7 months recovering from exhaustion. It is loads of fun though, and we have really enjoyed being a member of SAPA and the friends we have made.